Bed bugs are a major nuisance not only at home but for travelers around the world. The bugs pose an uncomfortable situation as their bites are extremely itchy and create unbecoming rashes. For some, bed bug bites result in an allergic reaction. Innovations are coming out to help travelers deal with the bed bug scene. For example, it has been determined that when bed bugs are subjected to heat on the outside of luggage, the vast majority of the bugs are eliminated. Heat has become a promising tool for professional NYC bed bug exterminators. The research was conducted using soft-sided suitcases where bed bugs often hitch rides. Male bed bugs were placed on the outside and then they were exposed to heat. In less than 10 minutes, all but one of the 250 bed bugs had been killed. It was also determined that bed bugs placed on the outside of the luggage and left at room temperature for 24 hours were not as active as might be expected. In this study, only three percent of the bed bugs moved inside the luggage supporting the observation that the use of heat has a positive impact on decreasing the spread of bed bugs. For help with bed bug eradication, our NYC bed bug exterminator techniques use top-of-the-line techniques and equipment. For more information on how to deal with pests, contact us at Stern Environmental Group. A few months ago we reported on the findings of the research on the effects that Total Release Foggers (TRF) had on bed bug infestations. The study was conducted by Dr. Susan Jones at Ohio State University. Her research focused on using three popular Total Release Foggers, otherwise known as bug bombs. 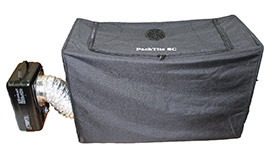 The bug bombs are commonly used by consumers to kill a variety of pests, including bed bugs. Her test included bed bug subjects collected in the field as well as ones that were lab strains. The lab reared bed bugs are considered to be more susceptible to pesticides than those collected in the field. The results of the study that she conducted showed that both types of bed bugs were immune to the bug bombs. The news of bug bombs not working on bed bug infestations was surprising to consumers, but not surprising to pest control professionals across the United States. According to Mike Merchant’s accounting of the November Entomological Society of America’s Annual Conference in Knoxville at “Insects in the City”, another study of TRF’s was conducted by Coby Schal of North Carolina State to research the effective rate of bug bombs for the control of cockroaches. Despite being commonly used by consumers, his research is the first test study for bug bombs versus cockroaches. According to reports, Schal used wild cockroaches as well as lab reared cockroaches in his test study. Two popular consumer bug bomb products were chosen to be tested. As with the lab reared bed bugs, lab reared cockroaches were more susceptible to death by the pyrethroid bug bombs. The interesting results were that the lab reared cockroaches did not stand a chance against the bug bomb, but the pesticide had no effect on the wild cockroaches. According to reports, his study showed that the wild cockroach population actually increased despite the pesticide application. Many questions now remain because of this cockroach study as to why the wild cockroaches did not die. Have the cockroaches become resistant to these common store bought pesticides? Cockroaches are known to be able to hold their breath for at least 40 minutes. Could cockroaches actually stop breathing for longer periods of time if they detect a strange odor? Were the cockroaches able to hide in a location where the pesticide was not able to reach? Consumers unfortunately do not always follow the directions on the bug bomb that is provided by the manufacturer. Failure to follow the directions has resulted in serious illness, fires, and explosions when Total Release Foggers are used incorrectly. The big question is…If the TRF is ineffective, will the Environmental Protection Agency change its current guidelines? Bed bugs are not only a problem in the United States, they are a worldwide problem. Many countries around the world are working feverishly to try to find ways to get the bed bug problems under control. Like in the United States, bed bugs infest all types of housing structures. Insecticides that are used in many non-westernized countries often have no regulations that they fall under in the foreign lands they come from. Because of the lack of regulations, many people have become ill and/or have even died due to too much insecticide being applied. This has been especially notable in the international hospitality industry whereas several tourist deaths have gained worldwide attention in the past couple of years. When there is a bed bug infestation, they will gather in clusters. The researchers have found that there is a limit to the amount of bed bugs that will cluster together at any given site. Once the limit has been reached, the cluster of bed bugs will break apart and spread into other areas of the home or business. • Pest control professionals should look beyond the bed and make their control efforts wide spread in order to reach full eradication of bed bugs. • Apply the maximum amount of insecticide that the label and the state allows in order to control bed bugs. If you have ever had a bed bug infestation, you know that there are many social implications that are associated with having the bloodsuckers in your home. If you have not had an infestation, consider yourself to be among the lucky. The social implications of having bed bugs are not widely discussed. Many people focus on tactics of killing the pests, pesticides that are used, lawsuits that are filed, and places that have the critters. People who have had or do have bed bugs suffer from the pests in many ways. Bed bugs can take an emotional toll on their victims as they often cause a lack of sleep. People who have the pests often report that they wait up at night for the bloodsuckers to surface. They also report trouble sleeping as they know that the bed bugs will arrive soon after they have drifted off. People who have experienced or are experiencing a bed bug infestation are often shunned by family and friends. It is not surprising that upon learning about a bed bug infestation, that people tend to not want to come to your home, nor do they want you to come to theirs. Even long after the pests are gone, it is not uncommon for family and friends to be afraid of visits because bed bugs are so difficult to eradicate. There have been incidents where people who have had bed bug infestations have been fired from their jobs. In today’s economy, employment is difficult to come by. Some employers have been worried about bed bugs being brought into the work environment, which is a valid concern, although firing an employee because of bed bugs is not legal. People who have bed bugs do not often tell their co-workers about the infestation, and those that do report that they have them are often shunned by their peers. 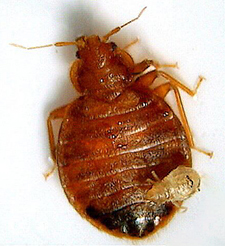 Victims of bed bug infestations can feel like a leper. It is important for everyone to take precautions against these troublesome pests at all times. If you suspect that you have bed bugs in NY, NYC or NJ, contact Stern Environmental Group for expert bed bug eradication services. How Do We Keep Elderly Folks Safe From Bed Bugs? As the summertime travel season draws to a close, many people are returning home from their vacation travels with an unwanted souvenir. Bed bugs continue to find their way into American homes from coast to coast. Although some cities have seen a decline in their bed bug reports (New York City), others continue to be plagued by the bloodsuckers, with no signs of relief. NYC pest control experts, and those from around the United States, do not know the exact cause as to why bed bugs continue to thrive in the US. They suspect that the lack of knowledge about the little vampires, their increased resistance to the pesticides, as well as the ease of international and domestic travel is all contributing factors in the bugs’ ability to continue to multiply. Nursing homes are hotspots for bed bug activity for several different reasons. Bed bugs are attracted to heat and the CO2 that humans exhale. A person lying in a bed for any period of time, especially a long period of time such as residents in a nursing home would be, would attract hoards of bed bugs to the bed side. Because people live in close proximity with shared walls, any infestation in a nursing home will quickly spread from room to room. Nursing home facility workers must check often for the signs of bed bugs as adult and nymphs are easy to see. At the first sign of the bloodsucking pests, they must immediately call a pest control professional for fast bed bug eradication services.